Every semester, a few students at Brigham Young University learn about edible plants, skinning animals, setting traps, building shelters and making fire without matches through BYU’s Wilderness Trek class. The final this year was particularly eventful. The podcast below gives an inside look into the individual stories of some of the students who participated, as well as two videos teaching a couple of the skills taught in the class. Why did I take this class? It was a question I hadn’t stopped asking myself for the previous 48 hours. I asked it when I lay shivering in my soaked sleeping bag, when I stood in dripping wet clothes as snow came down in large flurries, when they separated me from class and left me to survive on my own in the wild. Why did I take this class? The survival class sounded like a good idea two months ago when I signed up for it. They told us the final would be four days long, that they would separate all of us and survive based off the skills we had learned. I could be home! I thought. 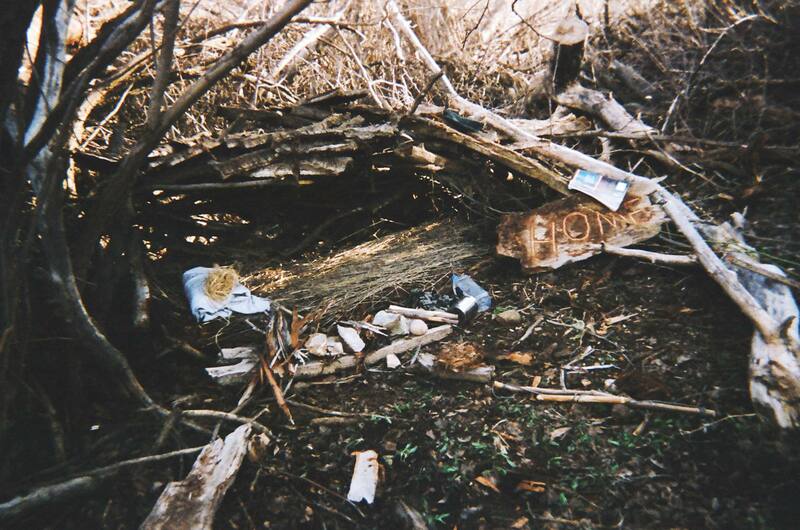 At the time I was sitting by my homemade shelter made from branches and bark. Home. I stood up and searched and found a large piece of bark and then started carving that very word: Home. Later, in charcoal I would add below the poorly carved “home” the words “sweet home” to read “Home sweet home.” This little signed changed everything. I began to “tidy up” camp, brushing away the dead leaves and twigs, dragging a large fallen branch over to sit on, creating little tables for my tools and food. Suddenly, I wasn’t just surviving: I was thriving, and it was all because I had created a “home sweet home.” So many times even in my own, snug, cozy life I had been living moment to moment, simply trying to get by to the next day. In the back of my mind, I knew that I would be leaving that makeshift shelter in just a day or so, but that didn’t matter. This home had become a place that I thrived in, and I knew coming back from the final I would do everything in my power to make my little apartment a place where I could continue to thrive. They say home is where the heart is. I used to see that as a passive phrase, that home would just happen to be wherever my heart was and that where my heart would be was completely out of my control. I know now that you can make a home by working to put your heart and love into wherever you are. Darkness encompassed us, coming up from behind and stretching out as far as the eye couldn’t see. Mixed with the darkness was the rain, rain which brought out the smell of gravelly dirt and the sagebrush and juniper on either side of the path. Soaked as it were by the sky, I kept walking. We all did. It sounds surreal, like a scene from a gloomy nightmare or depressing movie, but this scenario was very real for me and my classmates. We signed up for a survival class and for the final test went on a four-day excursion to prove our skills. Little did we know that for the first few hours of the trip, our teacher would march us through the desert with no light, no way to tell the time, and no knowledge as to how far we had walked nor how much further we had to go. None of us had eaten since 6:00 p.m., and we had started the hike around 10:30 p.m. Later, we learned that we had hiked for around four hours and a total of eight miles in that dreary desert, but again, at the time we had no sense of time or distance. I thought about life and the past few months, how so much of this past winter I had felt like I was on a metaphorical dark road, hiking through the night with no idea how much further I had to go. Why couldn’t God just pick me up and take me to the end of my trials? Why can’t I be that girl? And then distinctly I felt the words: Because I know you can do this. That girl couldn’t physically complete that trek– but I could. I was still on that dark road, both physically and metaphorically, because God did know the distance, knew my capabilities, and knew that I would be able to make it through the rain and the darkness to the destination. If you feel like I did on that desert road, dreading every step and wondering how much further you have to go, remember that someone else has walked that road before. Christ knows you and He knows that road perfectly, and if you haven’t been driven to the end, then know it’s because you can do this. Keep hoping; keep walking. Sparks. Over and over again just sparks. I sat on my makeshift camping chair (a large, fallen branch) for two hours striking that “flint” (a rock I found in the woods) with my steel buffalo striker, rubbing my knuckles raw, and nothing. Behold all ye that kindle fire, that compass yourselves about with sparks, walk in the light of your fire and in the sparks which ye have kindled. This shall ye have of mine hand—ye shall lie down in sorrow. I remember that feeling of compassing myself with sparks—that flash of hope you get when out of the darkness you see a brief flicker of light, and then you strike harder and harder and get spark after spark, but none of it sticks; nothing lasts. And there’s an analogy in that, of course: all our “walking in our own light,” our self-made successes are temporary. They are just sparks. They light our life for a moment but leave as quickly as they come. They don’t catch. After a couple hours, I had a little savior. My friend brought me charred cloth. The sparks had something to catch on, and when one finally landed perfectly on the charcoal material, the small nest of sticks and plant fiber lit up and finally, I had a fire. Our attempts to do it by ourselves, following the sparks of our own successes, are not enough to build a lasting fire of warmth and light. Ironically, charred cloth can only be made by another fire, and so we rely on someone else’s previous fire to give us material that can make our own. Our Savior has made that fire; he has prepared for us the material to make our own. Without Him, nothing in this life can truly catch—can truly stick and sustain us. I bury my face in my hands, finally realizing what it was. I just want to get it right. The past few months—past year even—felt like a complete failure. That, of course, was also me being a little melodramatic, but it was also me realizing how perfectionistic I was. The counselor looked at me, waiting for me to say more, but I didn’t. “And who wanted to get it right?” He asked. I lifted my head out of my hands, confused. He repeated the question. “I…I don’t know…” I said. Then he said something that changed my life. Many of us have heard the story about Heavenly Father presenting a plan to his children before we came to this earth. In this family council, there were two ideas offered up for how we would be saved. Satan essentially presented a plan in which he would force us to do everything right, taking away our choice. “But what did the savior want? Did he want us to ‘get it right,’ as you say?” My counselor asked. Then my counselor continued, “We like to compare life to a test, like we are given a set of multiple choice answers and there’s only one right answer. If you make the wrong choice, you get deducted a point. But I don’t like that analogy. Satan wanted us to get it right, and Jesus Christ wanted us to make choices. I liked the idea, but I struggled with it—and sometimes still do—because I couldn’t help but feel like there had to be one choice that was better than another. I learned that sometimes there are, but the good news is we have someone who makes up for those poor decisions, our Savior Jesus Christ. It’s easy to feel bitter about the traditional high school when it’s sharply contrasted with a radical, project-based, technology-heavy magnet school just down the street. As a student who found herself in that exact position in high school, I vehemently argued for the traditional ways of high school, desperately trying to prove that even in a broken system I, too, could succeed just as much as any student with a lap top and some radical new practices. But, if I were to let go of my pride and be honest with myself, I would completely agree with the radical, innovative approaches to education—anything that would be a move away from the assembly-line model of the traditional high school I attended. For me, the underlying principle of these radical changes would be in increase in personal freedom for students and teachers alike. The first way to increase freedom is to increase access, including access to experts, technology, and supplies. In my ideal school, every student would receive a personal computer. Students would also be able to rent high-end cameras, sound systems, and other equipment in order to aid in projects and personal endeavors. Often students are limited in their options because of their inaccessibility to technology; more access would create more options, leading to more overall personal freedom to explore academic pursuits. After providing the tools to the students, teachers and administrators should provide direction. That is, share the state and school standards of education for the child, but then together as a teacher and student develop individual objectives for fulfilling those requirements. Allow the student to be involved in deciding his or her education. For example, students can choose to fulfill requirements for learning about the French Revolution by organizing a mock trial for King Louis XVI or Marie Antoinette; or, to fulfill a requirement concerning understanding sound waves and physics, students can collaborate to create a Ruben’s Flame Tube and then organize a visit to a sixth grade class to explain the physics. Students should also be involved in the evaluation process by providing a reflection essay or speaking one-on-one with the teacher about personal performance. Notice that both the examples concerning personalized exploration of education includes students collaborating in groups. Collaboration is an essential skill for life, and beyond that, working together in teams open up more opportunities for academic exploration. Two or three or four people can arguably do far more than one person alone. Of course, some students prefer to work in smaller groups or even individually, but my ideal school would emphasize open communication in groups about these specific preferences. The student who prefers to work individually can communicate his or her desire and the group can come up with solution that best meets those individual’s needs (such as assigning the individual a task that is best done alone but will contribute to the group’s effort). Differences in individual’s work preferences are encouraged because it allows students to problem-solve and negotiate those preferences. The ideas discussed aren’t particularly radical, but rather a step in the right direction. I saw firsthand how difficult—but still possible—it is to create a completely project-based, flexible, freedom-enhancing high school, especially when considering the teacher, parent, and community backlash against such radical changes. However, I also saw how manageable it is for those radical ideas to slowly trickle into the traditional high school setting. The basic principles of increasing student freedom by creating more accessibility, providing flexibility in approaching learning standards, and encouraging working collaboratively on projects can drastically improve a traditional high school setting—this coming from a student who witnessed the adoption of these principles and their effectiveness in a traditional high school. Perhaps the “ideal” is a little more achievable than we give it credit for. Steve Peck remembers his week of horror vividly: the giant insects flying around the hospital, his daughter’s innocently hand-drawn pictures that took life and began speaking to him, the evil clones of his wife and children conversing right outside his door. To Peck, it was all real, and the madness had narrative and twisted explanations. Almost too late, one doctor discovered Peck had a rare bacterial infection Peck picked up in Vietnam when he was there studying butterflies a year prior.